Ahh with Thanksgiving fast approaching, I already can feel the impending gluttony of the upcoming holiday season. Of course I won't let that stop me from eating out (I know, I have issues...) but I guess I should try to make some healthier choices! 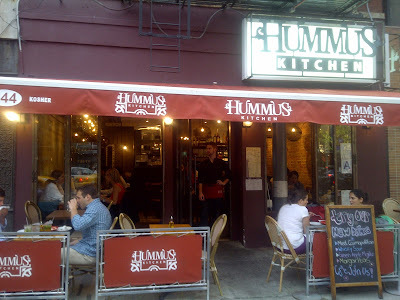 A friend recently suggested Hummus Kitchen and I thought why not, lets give it a try! With a couple locations around the city, on this occasion I visited their Kips Bay location. 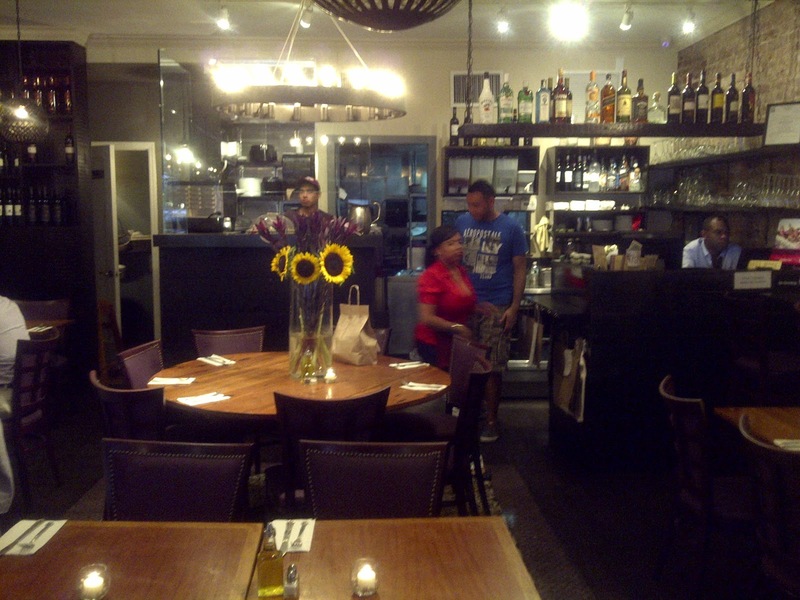 When you walk in, you'll see simple wood tables and chairs and exposed brick wall. The lighting is bright and I can clearly read the menu (the way i prefer it!) and this spot is perfect for a casual weeknight dinner! 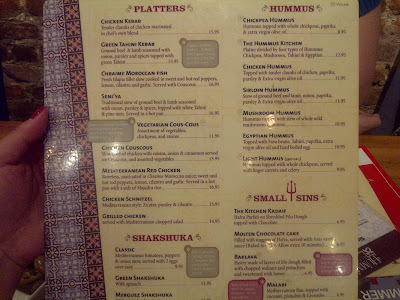 Looking at the menu, its a pretty simple menu offering standard Mediterranean/Middle Eastern fare. 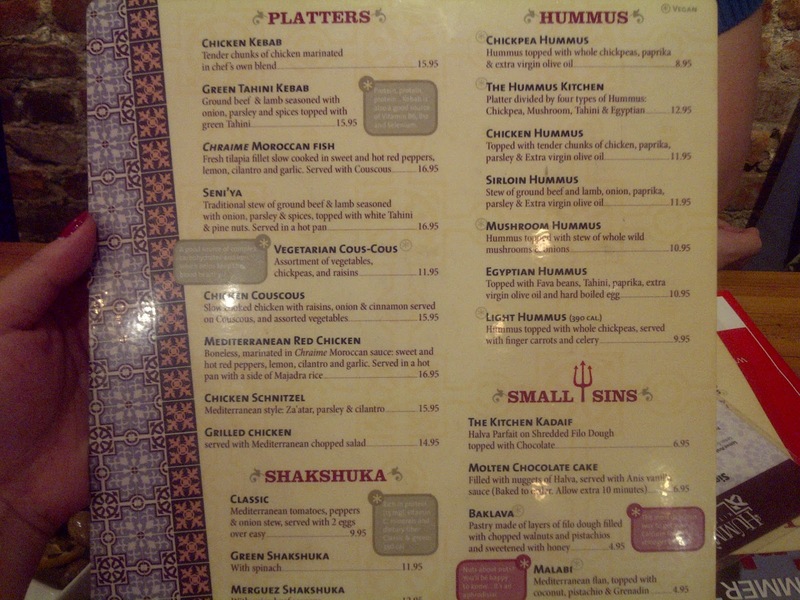 I like that its a simple menu yet offers a good variety of everything. To start, my dining campadres and I split the Mazze Trio with Hummus, Falafel, and Bureka (puff pastry stuffed with eggplant and potatoes). 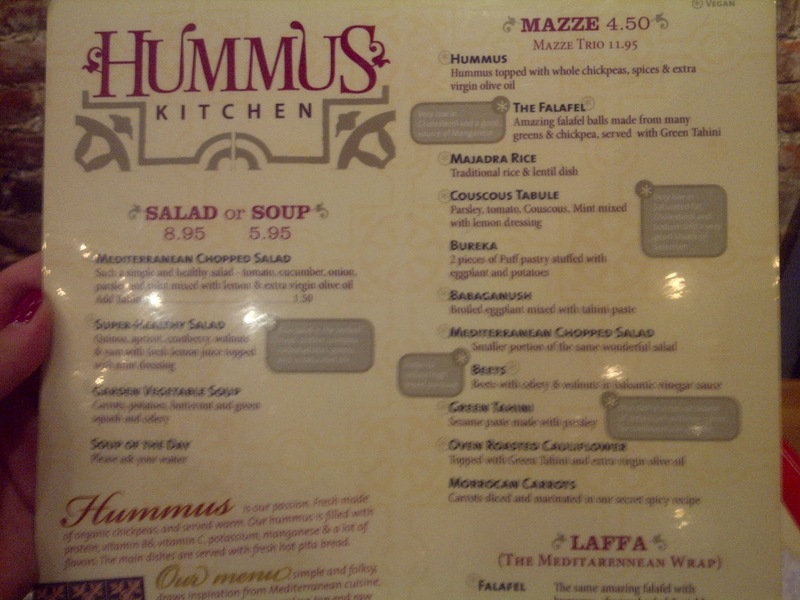 Here's my confession: I don't like hummus or falafel, etc. 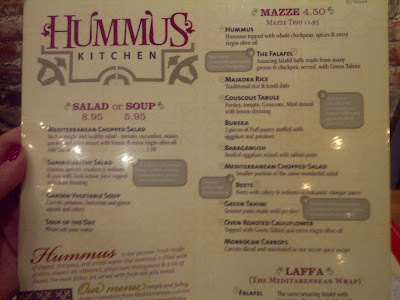 So what am I doing at Hummus Kitchen? I dunno I try not to knock it till I try it! 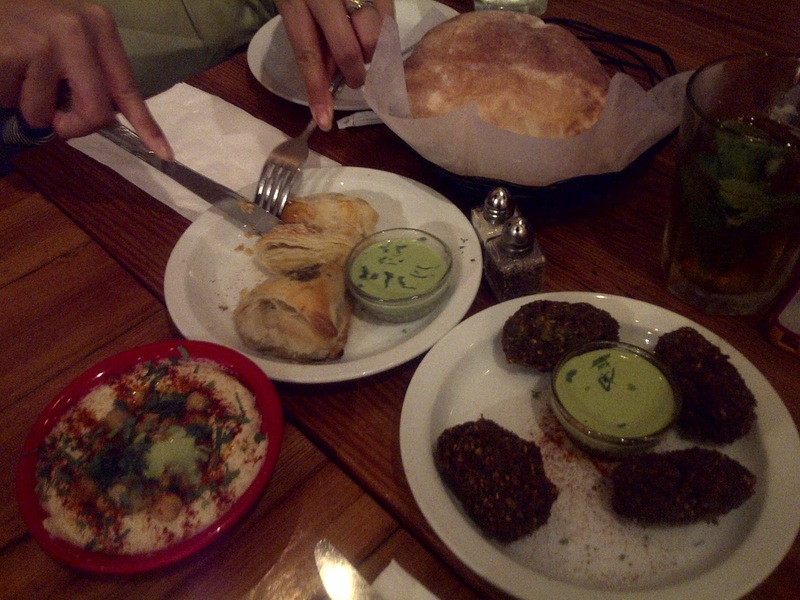 As for the appetizers, I don't have much to add since I don't enjoy it to begin with, but my dining compadres seemed to enjoy it enough. For the entrees, the two popular dishes at our dinner for 5 people were the Chicken Kebab and the Mediterranean Red Chicken. 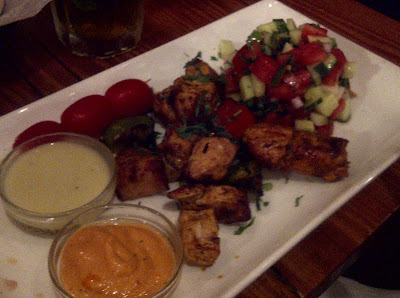 The Chicken Kebab was marinated and grilled for an overall great and light dish. It usually comes with rice (YES!) 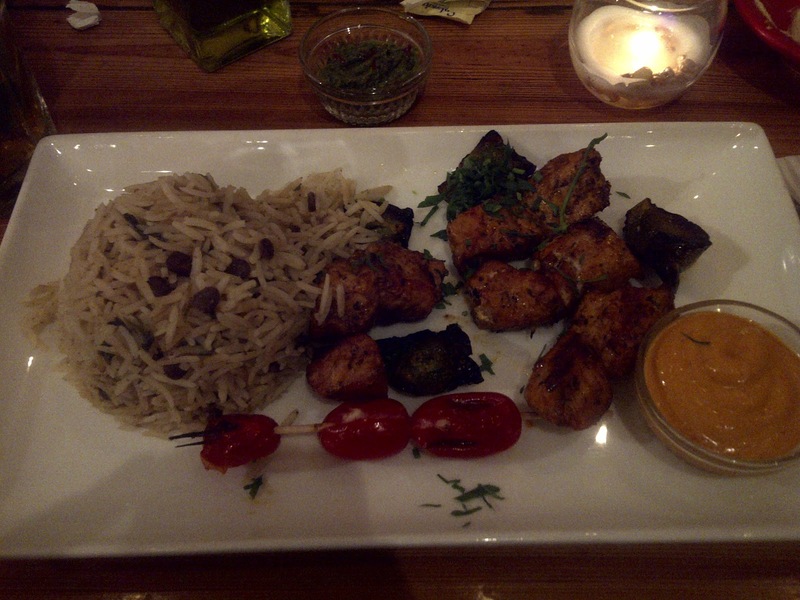 but if you are looking for an extra light option, ask to swap that out for the Mediterranean Chopping Salad (which also looked delish). The Mediterranean Red Chicken dish is chicken marinated in a Chraime Morocccan sauce with sweet and hot red peppers, lemon, cilantro, and garlic all served in a hot pan. 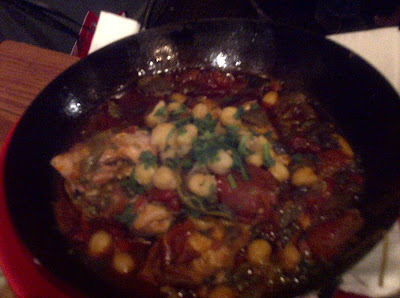 Lots of great flavor in this dish! so good! glad to hear you enjoyed too!